BOOM! 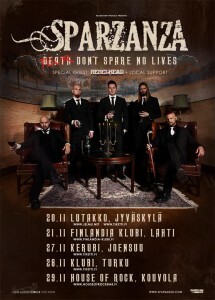 we are coming back to Finland in November, this time we will come to cities we have not visited for a while. We will have RebelHead with us on the tour plus some local bands that deserves to be noticed – but more on that later. Subscribe to the Sparzanza newsletter and get special offers on merchandise and more!